Note: New York Sea Grant's (NYSG) Long Island Sound Study (LISS) Educator Larissa Graham, who is featured in the story below, will be leaving her post at NYSG on Friday, January 18, 2013 after five years. She is relocating to Ocean Spring, Mississippi, where she has accepted the Coastal Training Program Coordinator position at the Grand Bay National Estuarine Research Reserve (NERR). A new NYSG LISS educator is slated to begin in March. Stony Brook, NY, January 14, 2013 - Wetlands are a crucial ecosystem that help to keep things in check. And, as we're seeing all over the world, they are in danger. Last February, New York Sea Grant's (NYSG) Long Island Sound Study Educator Larissa Graham and Web Content Manager Paul C. Focazio re-visited some sites in the New Orleans area as part of the second joint habitat restoration and wetlands education trip with the New York State Marine Education Association (NYSMEA). “The draw of our first trip [in February 2011] was to help clean up after the Deepwater Horizon oil spill,” Graham told WaterMarks magazine in October 2012 (Click here for the full article, which is in PDF format). WaterMarks is a monthly print publication featuring Louisiana's coastal wetlands planning, protection and restoration news. Louisiana’s wetlands are being lost at an alarming rate—approximately one football field of wetlands is lost every 38 minutes due to the canals that have been dug for oil transportation, the floodwaters that have ripped through the area during hurricanes, and the damming and channelization of the Mississippi which used to supply sediment to replenish these vital areas. If these rates continue, an additional 800,000 acres of wetlands will disappear by 2040, and the Louisiana shoreline will advance inland as much as 33 miles in some areas. Similar concerns over wetland loss are mirrored in New York wetlands such as Jamaica Bay, a 39-square-mile estuary that includes portions of Brooklyn, Queens and Long Island's Nassau County. During the "State of the Bay: Past, Present and Future—Revisited" symposium, a New York Sea Grant (NYSG) co-sponsored event held at Brooklyn College this past fall, scientists discussed restoration plans for the bay's salt marshes, which are being lost at a rate of 44 acres per year. The NYSMEA-NYSG trips were also profiled last spring and summer by, among other outlets, the National Oceanic and Atmospheric Administration's (NOAA) Coastal Services magazine. 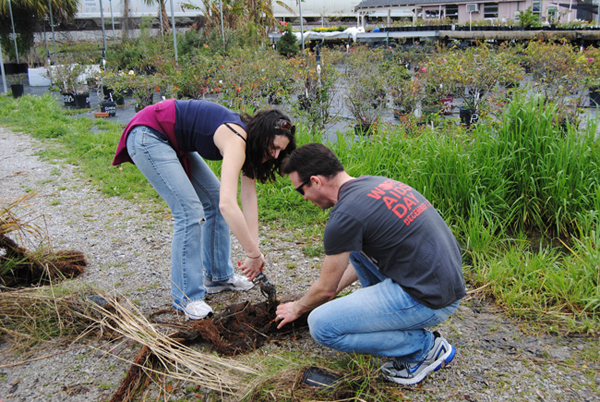 For more on that, as well as links to some related photo series, press releases and blog entries from both the 2011 and 2012 trips, see NYSG's related news item, "New York Educators Bring Louisiana Wetlands Stewardship Back Home." New York Sea Grant (NYSG), a cooperative program of Cornell University and the State University of New York, is one of 33 university-based programs under the National Sea Grant College Program (NSGCP) of the National Oceanic and Atmospheric Administration (NOAA). Through its statewide network of integrated services, NYSG has been promoting coastal vitality, environmental sustainability, and citizen awareness about the State’s marine and Great Lakes resources since 1971. For updates on New York Sea Grant activities, www.nyseagrant.org has RSS, Facebook, Twitter and YouTube links. All photo below by or courtesy of Paul C. Focazio, New York Sea Grant. Check out more pictures and details from the February 2011 and 2012 habitat restoration and wetlands education trips at http://nysmea.blogspot.com - see entries from February-early March 2011 and February-April 2012. 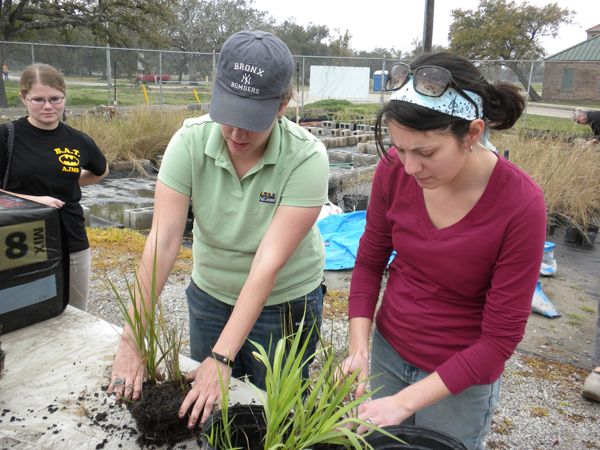 New York Sea Grant’s Long Island Sound Educator Larissa Graham, pictured here (at right) in February 2011 with Former Louisiana Sea Grant extension specialist Caitlin Reilly, planned a second plant propagation at the Wetland Plant Center in New Orleans' City Park in February 2012. February 2011's trip to the Wetland Plant Center in New Orleans' City Park included NYSMEA and NYSG staff volunteers as well as several dozen students from Andrew Jackson Middle School in nearby Chalmette, Louisiana. The group propagated 2,700 strands of Gulf bluestem (a wetland plant) and re-potted 320 Spartina alterniflora (smooth cordgrass, a wetland plant), for future WPC restoration efforts. All weeds were removed from each Spartina plant, as the plants do not compete well once planted. 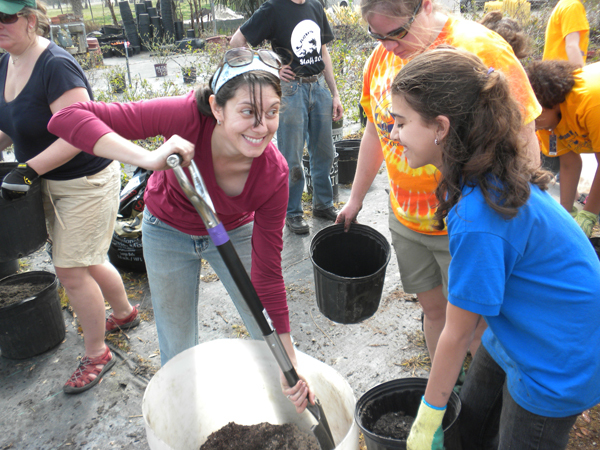 Also, the plants were re-potted using a combination of mostly sand with some mulch and peat moss, which NYSG's Larissa Graham is seen here mixing. Any browned portions of the restoration grasses were separated out and placed in a compost pile on-site, as shown here during the February 2012 visit to the Wetland Plant Center by NYSG's Larissa Graham and Paul C. Focazio. 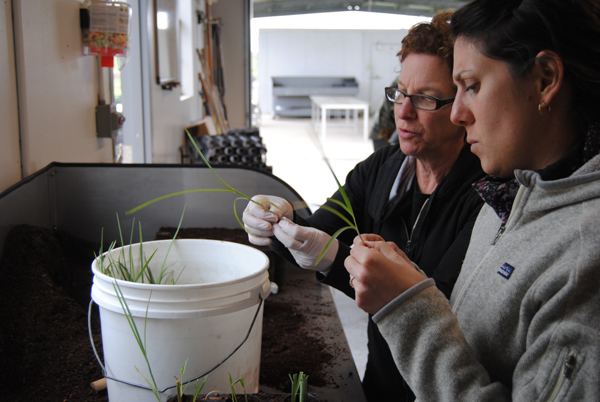 Educator Elizabeth Yanuck-Platt is pictured above with NYSG's Larissa Graham at the Golden Meadow Plant Materials Center in February 2012, where she and other educators propagated restoration plants including Gulf bluestem by clipping fully-grown ones, placing several clippings in separate sections in a tray and then trimming the clippings to spur additional growth and increase their chances for survival.